Or you just want to look and feel better... You might start with this SUPER weight loss protein supplement with antioxidant fruits and GREENS. Why start here? 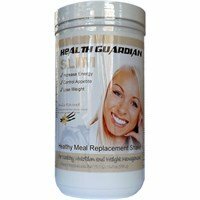 Health Guardian Slim® is a SUPER meal replacement that will do wonders while you are changing your diet for the long term. SUPER Nutritious Tasty Meal Replacement with 97 calories! With only 97 calories per serving these shakes are easy to make. Power-packed with nutrition to easily get your daily fruits and vegetables, with 24 vitamins and minerals. Why do Thin People Put on LESS Weight than Obese -- same CALORIES? Do NATURAL Fat Burners Work? QUIZ: Which are Weight Loss Fats and which Fats are Deadly? Insulin Sensitivity Fat Loss Connection? Why THIS Weight Loss Protein Supplement? With this weight loss protein supplement it won’t be long before the pounds start disappearing and the inches begin to shed. Great-tasting 97 calorie MEAL REPLACEMENT packed with NUTRITION! A meal replacement shake that combines a protein powder for weight loss and a powerful nutritious and great tasting green drink all in one! Health Guardian Slim® may just be the best tasting protein shake on the market today. Need EXTRA HELP with one of the best natural fat burners? Yes a weight loss protein supplement will help with hunger and calories. But for FASTER weight loss, try Health Guardian Trim® which is formulated to increase the metabolism so you can be burning fat to muscle all day long! 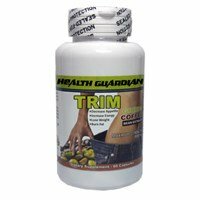 Health Guardian Trim® is a unique green coffee bean extract combined with 4 other thermogenic nutrients that will maximize fat burning while providing a natural all-day energy without the jitters. And FINALLY lose that WEIGHT!!! Combining this SUPER protein shake with these 5 NATURAL fat burners combo, is as good as body fat loss supplements get!!! Surprise Weight Loss Diets Health "no-no"
Why NOT drink carbonated drinks or sodas? Even DIET sodas? Did you know that even diet drinks WITH NO CALORIES can make you FAT?? They found that sodas release the HUNGER HORMONE GHRELIN and therefore make you more HUNGRY. Better stick to drinking water, green drinks and a weight loss protein supplement! 1. Carbon dioxide in carbonated beverages induces ghrelin release and increased food consumption in male rats: Implications on the onset of obesity. Obes Res Clin Pract. 2017 Sep - Oct;11(5):534-543.